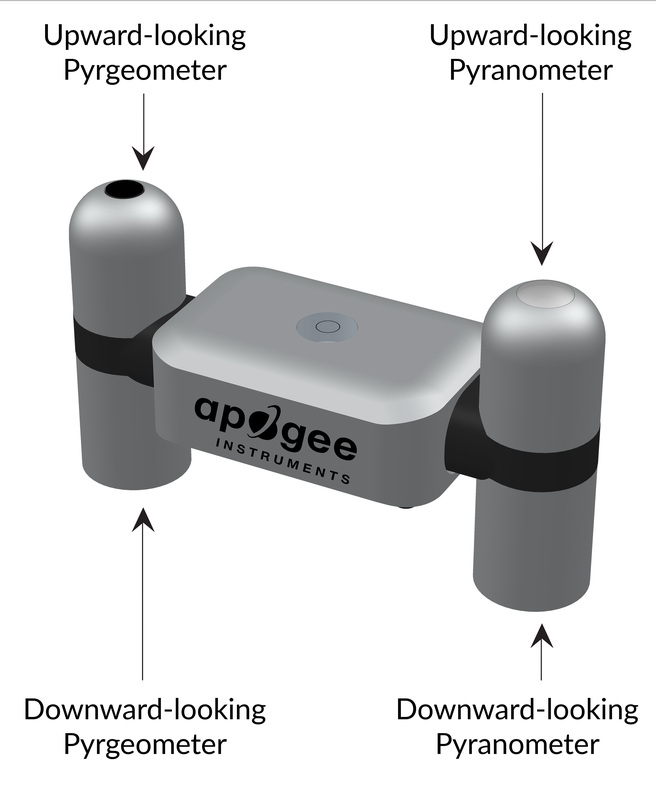 Apogee Instruments' new four-component net radiometer provides individual measurement of net radiation components. The sensor features an SDI-12 output, eliminating the need for multiple analog channels to measure the individual components of net radiation. The net radiometer comes as a complete package that includes net radiometer, mounting rod, pigtail lead cable for datalogger interface, and carrying case. Apogee net radiometers feature onboard A/D conversion and SDI-12 output to eliminate the requirement of multiple analog datalogger channels. An upward-looking and downward-looking pyranometer, and an upward-looking and downward-looking pyrgeometer provide separate measurements of the four components of net radiation. Each radiometer includes an individual heater to increase accuracy by minimizing the influence of dew/frost on the filter. Designed to be light weight and small in size to facilitate easy mounting.